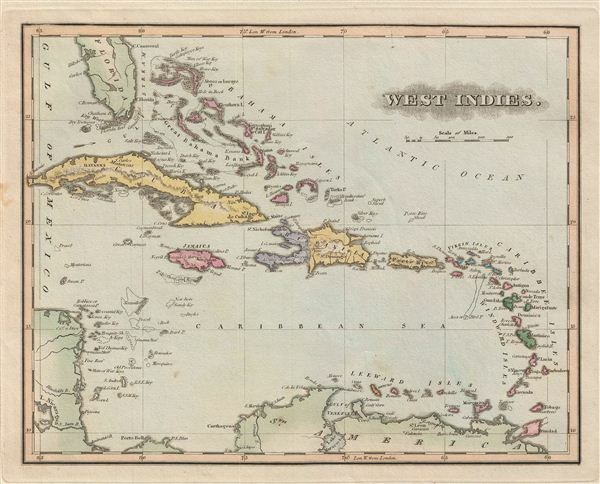 A fine example of the 1823 F. Lucas Jr.'s map of the West Indies and Caribbean. Centered on Hispaniola, covers from Florida and the Bahamas south through the Caribbean islands of Cuba and Hispaniola to the northern Part of South America and east to the Caribbean Islands or the Lesser Antilles. Includes the Bahamas (Bahama Islands). This map is published as part of the 1823 edition of F. Lucas Jr.'s A General Atlas Containing Distinct Maps Of all the Known Countries in the World. Lucas F., A General Atlas Containing Distinct Maps Of all the Known Countries in the World, 1823. Very good. Blank on verso. Original platemarks visible.